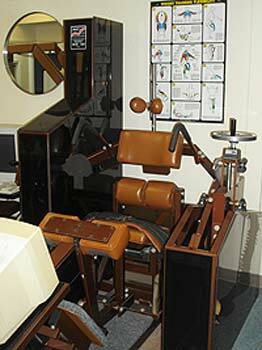 Med-X is the most sophisticated rehabilitative equipment in the world. The efficacy of Med-X has been extensively tested and confirmed through hundreds of studies published by the University of Florida in Gainesville, the University of California in San Diego, and other major academic and clinical institutions in Europe and across the world. How does Med-X work? This advanced equipment effectively isolates, tests and rehabilitates injured or weakened muscles of the spine unlike any other equipment available. During rehabilitative exercises, the muscles of the hips, buttocks, and thighs are restrained, and the pelvis is stabilized, thereby isolating and strengthening the muscles of the spine. This muscle isolation is the key to successful back and neck rehabilitation. The pelvis must not be free to rotate during exercises for the lower back. If the pelvis is allowed to rotate, larger muscle groups such as the hamstrings or buttocks will compensate for weaker lower back muscles, leaving them weak and inactive. Med-X has been very successful for treatment of muscle spasms, ruptured or degenerative discs, and bulging discs, and has produced positive results even for patients who suffer from chronic neck or back pain who have tried other methods without relief. Over 80 percent of patients who complete the program see positive results. When surgery to the spine is necessary, a post-operative Med-X rehabilitation program will improve the outcomes of surgery by reconditioning the surrounding muscles and helping the patient return to full function. © 2019, All Rights Reserved. Rehab Orthopedic Medicine, Dr. Ralph D'Auria.